A once-famous record producer and a struggling street musician meet in New York. 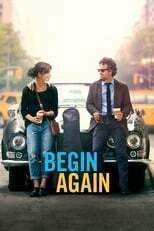 Begin Again is directed by John Carney and was released on Jul 11th, 2014. Director John Carney's Comedy & Music movie Begin Again is produced by Likely Story & Exclusive Media & was released 2013-09-07.